Do you Dream of a Candle with a Long lasting Scent that Spreads Throughout your Home? An Aroma that Lingers with a Fragrance to Envelop You. Your Search is Finally Over. Not only is your Sense of Smell Connected to the Memory, its also connected to your Emotional Receptors. Choosing the right scent can connect you better to yourself and things that Make you Happy. 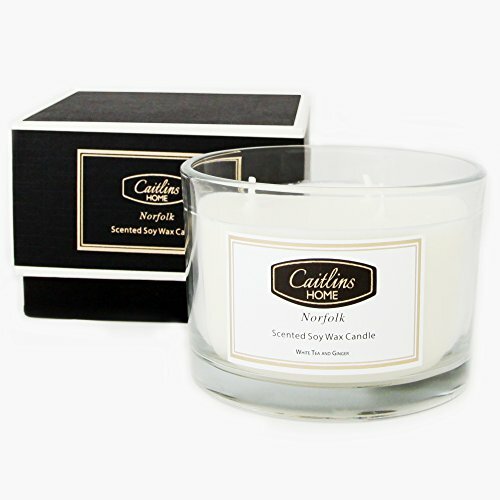 The Caitlins Home Range Offers Scents for every Mood, Sizes for Every Space and offer Glass or Tin to Enhance any Decor. Caitlins Home is COMMITTED to OUR PRODUCTS and Providing OUTSTANDING CUSTOMER SERVICE. All our candles are made from natural soy with lead free wicks which means you are gaurenteed. - Fragrance to fill your home. LARGE 3 WICK 13oz Candle - White Tea blended with the Subtle Warmth of Ginger to Balance and Envigorate the Mind. BENEFITS OF SOY - Natural, Renewable, Environmentally Friendly and Biodegradable. We Only use Premium Fragrance Oils to Accent any Home Beautifully. Perfect when Traveling, Eliminating Cooking Smells and Pet Odors. THE PERFECT GIFT for any Occasion-Thank You, Birthday, Get Well, House Warming, Wedding, Teacher Gift, Christmas, Baby Shower, Sorry, Girlfriend, Sister, Wife, Mother, Anniversary or Just Happy Monday or Friday. It Comes Beautifully Packaged in a Beautiful Rigid Presentation Box Ready to Gift. No Need to Purchase Gift wrap. EXPRESS YOUR PERSONALITY in the Kitchen, Games Room, Guest Room, Bedroom, Family Room, Spa or Office. CAITLINS HOME IS HERE FOR YOU. We stand by our products 100%. If you have any questions about our products please ask in the "Customer Questions & Answer" section. Caitlins Home has a 100% SATISFACTION GUARANTEE and offers our highly valued customers a Hassle Free Money Back policy. For more information please read the product description page. Look at "Special Offer and Product Promotions" for our current discounts. If you have any questions about this product by Caitlins Home, contact us by completing and submitting the form below. If you are looking for a specif part number, please include it with your message.